Act, Play, Ring, and Sing Out Loud at Merion! Young women at MMA have so much fun learning and performing music. 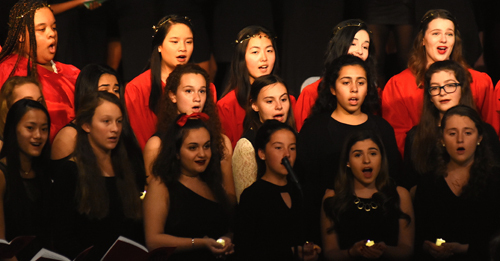 They cultivate many important skills, including collaboration, generosity, andintrospection and get to share their unique talents with performances throughout the school year. There are many opportunities for singers, dancers, actors, and guitar, bell, and orchestral instrumentalists to showcase their abilities, have fun, and grow in confidence. Click here for Performing Arts Dates for Spring 2019. Chorale participated in the Pennsylvania Music Educators Association 2019 Adjudication. They received a Superior Rating, the highest ranking. Of the group, the judges wrote, "These young women have a full sound and a warm, dark tone, a wonderful strong soloist, and are energetic and beautifully prepared." Click here to view the performance. Five students, Bella DeShayes, Kaitlyn Powel, Kaitlyn Grose, Kristen Rake, and Sarah Fritz have auditioned and been chosen to participate in the Kimmel Center's full-scholarship summer theater program, Showstoppers. Most of the music ensembles have begun for the 2018-19 school year, but students are warmly invited to join! Orchestra meets Tuesdays and Thursdays from 3:15-4:15 p.m., Handbells meet on Wednesdays from 7:45-8:45 a.m., Liturgical Choir rehearses on Tuesdays from 7:30-8:30 a.m., Guitar and Uku Band meet on Fridays from 3:15-4:15 p.m., Glee Clubmeets during any of the three colors of co-curricular time. Ukulele Club will meet during a co-curricular time. Private lessons are offered at Merion Mercy for guitar, voice, piano, brass, and string instruments. Please click here for more information. Please contact Cara Latham, clatham@merion-mercy.com with any questions. The Music Department provides a curriculum that challenges the student to discover her creative and intellectual resources and to develop them to her fullest potential. Music 9 is an introductory course for all freshmen in which students learn how to read music, experience playing in both a ukulele and handbell ensemble and write and record their own pop song. For those wishing to continue their music education, MMA offers two full-year upper level music courses that explore music history, ear-training, theory, and technology through composition. Upon completion of these two years of study, music students are well prepared for advanced study at the college or conservatory level. Tri-M Society is an international music honor society, which recognizes musical achievement, academic excellence, and community service. We offer two music scholarships per year, awarded on the basis of a personal audition (click here for a copy of the criteria and click here for policies/application form) and performance on the Scholarship and Entrance Exam. 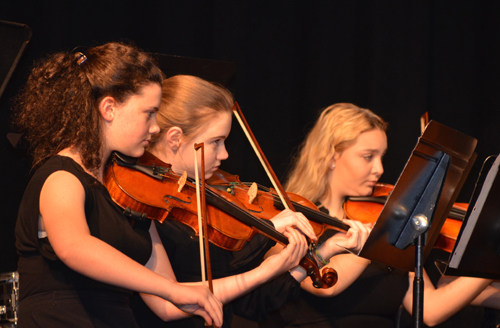 Our many extracurricular activities for the performing arts are open to all students. Perform repertoire from several periods in music history with various combinations of intimate chamber ensembles. Polish your vocal technique by singing a cappella, multi-lingual, and complex part-singing, studying more sophisticated repertoire in a chamber setting. Perform hip-hop dance and spirit moves with this cheerleading group that supports our Golden Bears athletic teams. Join other well-trained dancers to enhance liturgies through our unique offering of Liturgical Dance, and also perform modern, tap, jazz, and lyrical styles during the Christmas Concert, Carol Night, Performing Arts Festival, and other service-related venues. Hone your choral skills and have fun rehearsing and performing songs from a variety of musical genres. Share your gift of song with other classmates who raise their voices and instruments in jubilant praise at Merion's liturgies. Collaborate and create beautiful music through the sound of bells, offered for beginners through experienced bell-ringers! Study and perform a vast array of repertoire with other instrumentalists, from classical music to popular theatrical extravaganzas. Act, sing, and dance on stage or help behind the scenes with our acclaimed drama and music theater club. Click here for more detailed information and news of MMMT's upcoming shows!